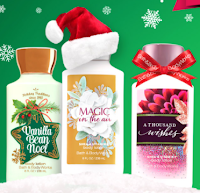 Today only, Bath & Body Works is offering up all of their full-size signature collection body creams and body lotions for only $3.50 each! These are perfect stocking stuffers! This is valid in-store or online (Use coupon code: OHWOW). There is a limit of 15 per order. If you're shopping online, don't forget to save 1% cash back through Ebates!